No doubt the attached illustration will speak volumes. 5 To overcome the multiple nutritional deficiencies, changing diet and including supplements will strenghten the immune system. 6 Chemotherapy involves poisoning the rapidly-growing cancer cells and also destroys rapidly growing healthy cells in the bone marrow, gastro-intestinal tract etc, and can cause organ damage, like liver, kidneys, heart, lungs, etc. 7 Radiation, while destroying cancer cells also burns, scars and damages healthy cells, tissues and organs. 8 Initial treatment with chemothreapy and radiation will often reduce tumor size. Howevver prolonged use of chemotherapy and radiation do not result in more tumor destruction. 9 When the body has too much toxic burden from ct and radiation, the immune system is either compromised or destroyed, hence the person can succumb to various kinds of infections and complications. 10 Chemotherapy and radiation can cause cancer cells to mutate and become resistant – hence difficult to destroy. Surgery can also cause cancer cells to spread to other sites. 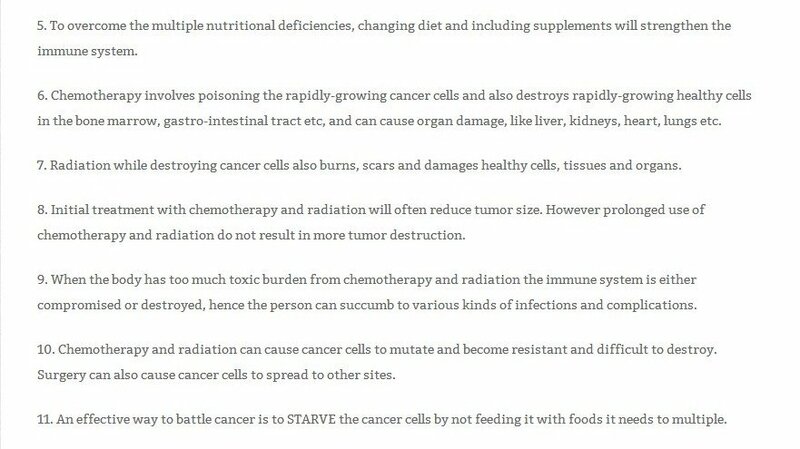 11 An effective way to battle cancer cells is to starve the cancer cells by not feeding it with foods it needs to multiply. Love this blog lots of good info !